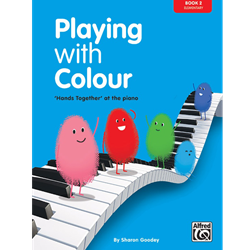 The Playing with Color series introduces students to music making from the start. Colored notation, numbered staves, as well as clear graphic illustrations for the right and left hands are presented in the beginning of each book. Thereafter, theory, rhythm, ear training, improvisation, and sight-reading exercises are gradually introduced so the student has the best possible platform upon which to build.